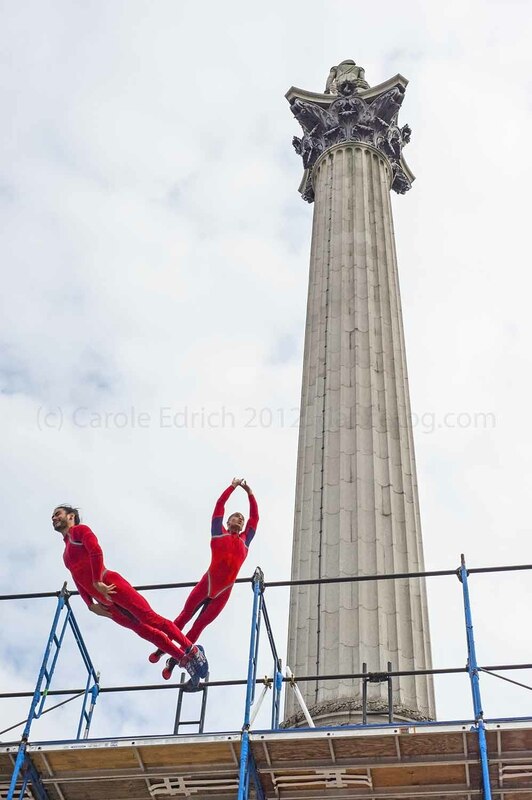 This is another shot from last week’s @SurprisesSTREB performances. I’ve chosen this performance because it’s one that has been less covered by the popular press, possibly because the rigid contraption from which the troupe threw themselves makes the shot busier and less visually arresting. I also like the shots of this performance because I met so many lovely people while waiting for it to happen. The entire project has an awe-inspiring complexity, both because of the way that iconic landmarks were employed as part of the performance and because of the way the troupe was formed of two groups from different continents who only came together shortly before the performance itself. While waiting for Acsension (the performance with the revolving ladder), some of the Brits told me they had auditioned and came from all walks of life including hip-hop, ballet and even office administration. That made watching the event even more moving, giving me insight into why they finished their performances with such enormous grins. I’m still processing all the shots I’ve taken, because there are so many. It’s looking like the entire summer will be nearly as busy as Big Dance, since the Mayor of London’s ‘Summer Like No Other‘ has lots going on. I really enjoyed the immediacy of this performance of the Human Fountain, the proximity of the performers, the details of light and shade on their many expressions and the fact that throwing oneself off a high place could be made into such absorbing art. However, as a photographer I’m forced to say it was a shame that the performance was done to Nelson’s back.